At a photo call in Kerry Airport today to officially launch the new weekly direct Kerry to Palma – Majorca service with Sunway Holidays were Kinga Grunau, Tralee; Noel Ryan, Kerry Airport, Dean James, Ardfert, and Jeanette Taylor, Agency Sales, Sunway Holidays. Offering a wide range of holiday packages for all budgets and age groups, the new service will operate every Thursday from the 27th June 2013 to 22nd August 2013. The flight will depart Kerry at 1630hrs and arriving at Palma at 2010hrs while the returns flights leave Majorca at 1345hrs and arrive into Kerry at 1540hrs (subject to change).For availability and prices on packages from Kerry Airport please phone Sunway on 01-2886828 or visit www.sunway.ie or contact your local travel agent. Come Fly With ME! 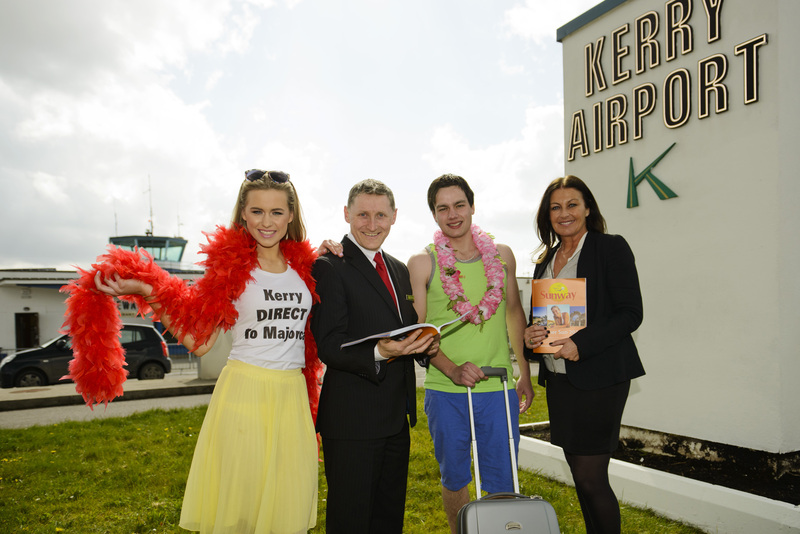 At a photo call in Kerry Airport today to officially launch the new weekly direct Kerry to Palma – Majorca service with Sunway Holidays were Kinga Grunau and Dean James from Tralee.